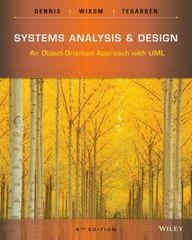 Systems Analysis and Design 5 Edition Systems Analysis and Design: An Object-Oriented Approach with UML, 5th Edition by Dennis, Wixom, and Tegarden captures the dynamic aspects of the field by keeping students focused on doing SAD while presenting the core set of skills that every systems analyst needs to know today and in the future. The text enables students to do SAD—not just read about it, but understand the issues so they can actually analyze and design systems. The text introduces each major technique, explains what it is, explains how to do it, presents an example, and provides opportunities for students to practice before they do it for real in a project. After reading each chapter, the student will be able to perform that step in the system development process.